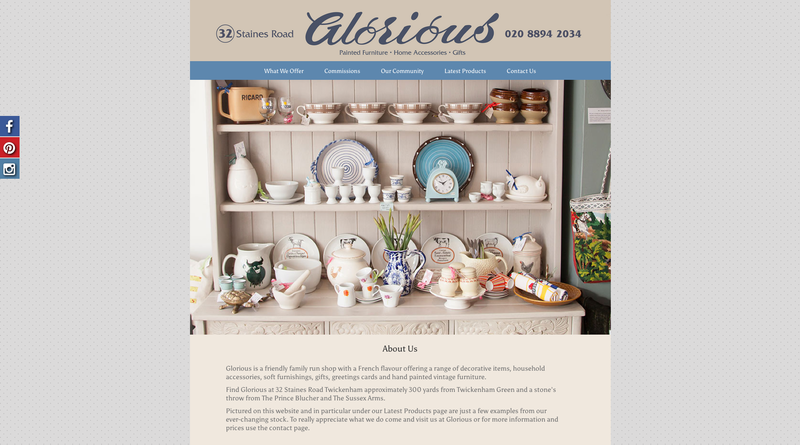 Located in Twickenham, Glorious is an independent boutique selling unique and vintage pieces, including household accessories, soft furnishings, gifts and hand-painted furniture. In recognition of the Glorious brand and it’s sense of vintage style and English country charm, we created a beige and blue design showcasing their range of interesting products – from up-cycled furniture to one-of-a-kind gifts and handmade furnishings. The top navigation directs users to different aspects of the services/products offered. The latest products page displays images of all items in stock which are linked to the company’s Instagram account. As an independent local business it was important for the client to include the ‘Our Community’ page encouraging local artists and crafty types to get in touch to enquire about stocking their products with Glorious. 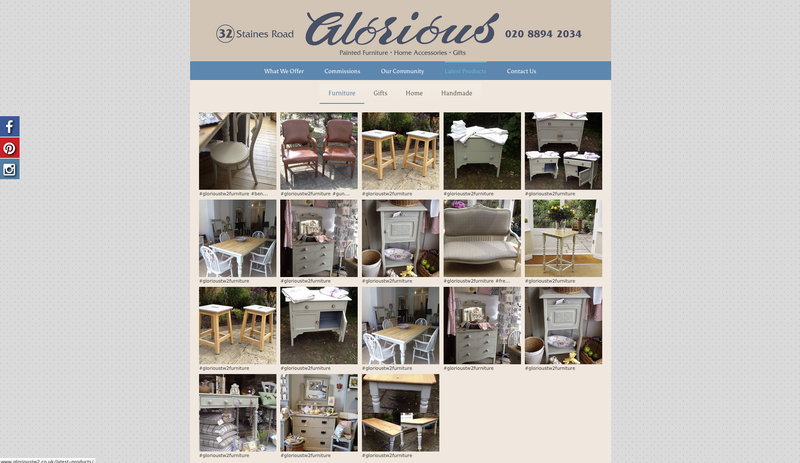 A ‘Commissions’ page also invites users to get in touch if they would like help renovating and refreshing items of furniture. Rather than setting up an online shop, the client wanted the Glorious website to be an introduction to the brand or somewhere returning customers could view the latest selection of items whilst keeping the traditional shop set-up, where customers purchase their products in person – a fitting approach for a brand bursting with old-school appeal.